As one of the most popular resorts in the US, Sun Valley reinvents itself with every season. Winter, of course, is for skiing and snowboarding and the lively apres ski scene. But summer here has its own unique charm, from golf overlooking Bald Mountain to fly fishing in the Big Wood River or Silver Creek to an easy hike up Baker Lake or Sunnyside Trail. This spacious townhome offers an ideal vantage point from which to enjoy all that nature has to offer here in Sun Valley. Mountain bikers will be especially thrilled to learn that the bike trail is literally steps from the front door. Three levels of stylish comfort afford your group maximum space and privacy. The reverse floor plan offers sweeping views of Bald Mountain from the top floor great room with its dramatic vaulted ceilings. Here, in addition to the incredible views, you’ll enjoy the warm ambiance of a river rock fireplace surrounded by comfortable furnishings and a flat screen TV for a relaxing evening in. The formal dining area is awash in natural light and graciously accommodates your group of 8. A generous patio offers al fresco dining with a seating group for 4. 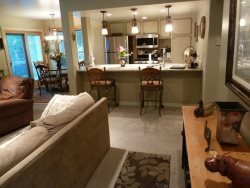 The updated kitchen has everything to make the group chef tingle, including stainless steel appliances, granite counters, a tiled backsplash and pendant lighting over an island seating 4. This expansive great room space provides ample opportunity for your entire group to comfortably gather together for meals, conversation or maybe a fun card or board game. When and if anyone craves alone time, the multiple levels make it easy to slip away and enjoy some privacy. Rounding out this top level are a hall bath with a corner walk-in shower, which sits just outside a carpeted bedroom with two twin beds. The mid-level includes a spacious master suite, with a Queen bed and separate sitting area, perfect for a few moments of reflective peace, whether it’s spent in meditation practice, reading or even catching up on social media. The master bath has a soothing whirlpool tub, separate walk-in shower, dual vanities and a water closet. A second Queen bedroom on this level offers a private bath with tub/shower and the wonderful added bonus of access to a private patio. The ground level can accommodate an additional two with a twin bunk set in a cozy bedroom. The fourth bath is also located on this level. A mid-size vehicle can fit in the garage, with one more vehicle in the driveway. Additional parking across from the driveway may be available in the off-season months. Whether you’ve come to Sun Valley to ski down the slopes or hike up them, or enjoy any other activity this stunning mountain town provides, you’ve found the perfect home base for your family and friends in this impeccable 4-bedroom, 4-bath townhome.